CleanSpace® Wall is a 100% waterproof plastic vapor barrier that's perfect for unfinished basement walls. With a 25-year warranty [PDF] for wear and tear, it's durable, washable, and has anti-microbial protection called UltraFresh built right in! CleanSpace® is pliable enough to cover uneven surfaces and irregular walls, including areas with large rocks or similar obstacles. Additionally, it's a great way to prevent humidity from making its way through your concrete walls and into your basement. CleanSpace® installs quickly, with most installations taking a day or less. Once the installation is complete, your basement will be ready to use immediately. Unlike paint and materials that adhere to the walls, CleanSpace® Wall is mechanically attached to your basement walls with plastic drilled-in fasteners so it will never fall off the wall. CleanSpace® Wall will never chip, peel, or flake away from the concrete like paints and sealants will. Any water seepage coming through the wall will be directed down into your drainage system. CleanSpace® is more than just a wall system- it's also a great way to cover large boulders or dirt sections of basement walls and floors. If you don't like your basement the way it is now, but you don't know what you can do to upgrade it, this is the waterproofing product for you! CleanSpace® Wall is a great way to fix those unsightly basement walls, while its bright white appearance makes great use of available lighting. And because it creates a vapor barrier on the walls, your waterproof basement will be ready for finishing should you decide to upgrade in the future! 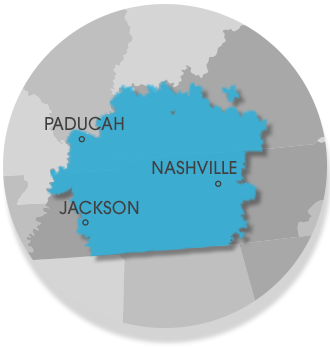 We service Nashville, Clarksville, Jackson, Murfreesboro, Owensboro, Philpot, Bowling Green, Fayetteville, Marion, Utica, Leitchfield, Franklin, Mcminnville, Paducah, Shelbyville, Hartford, Antioch and many nearby areas in Tennessee and Kentucky.